WAREHAM WINS THE 2018 CHAMPIONSHIP SERIES! Congratulations to the Wareham Gateman who defeated the Chatham Anglers 9 - 3. They swept the 2018 CCBL Championship Series and were awarded the Arnold Mycock Trophy. 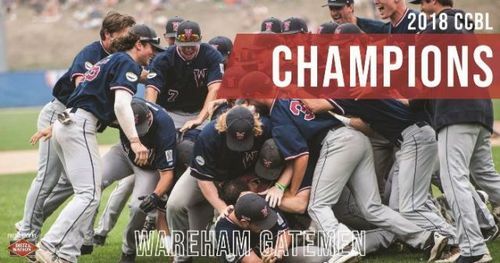 On Monday the Wareham Gatemen won their sixth straight game, going undefeated in the playoffs and winning the title. Chatham was up early in the first courtesy of a Colin Simpson single that scored Blake Sabol. In the third, Wareham took the lead on a single to right field from Austin Shenton that scored Lael Lockhart Jr. and Oliver Dunn. Another Gatemen run came in the fourth with a Lockhart single himself scoring Drew Millas. Both teams scored a run in each of the sixth and seventh inning including RBI singles from Lockhart and Shenton for Wareham and for Chatham a groundout and a solo shot from Simpson. Up 5-3, Wareham scored four runs in the ninth inning to seal the victory and ultimately the championship title. Millas doubled home two runs, followed by another two-run double from Gian Martellini that guaranteed the win. Congratulations to Wareham on their win, and we can’t wait to start the 2019 CCBL season!